In the mean time, I walked around clicking the multi-axle monsters of various operators that were parked around. It started pouring down by then - it was very heavy. I had no option but to return to the Kallada office. The clock ticked past 2115, there was no sign of the bus. Enquired with the guys at the office, who confirmed that the bus would arrive only by 2130. The bus, KA-01-AA-103, came in sharp at 2130. It was almost completely empty when it came - but it filled up in no time! We started off at 2148 - just as a lady in the bus started shouting that her husband was yet to board. The crew showed no interest in stopping the bus for him - but they later said they will take a 'U' turn and stop on the opposite side of the road - which they did. We were there until 2154 - few 'off' duty Kallada staff too got in - a guy slept in the undercarriage luggage hold, while the others took the seats in the last row. As we started off from Madiwala, the 'assistant' announced that we had only two vacant seats. The bus was about 13 months old (info gathered from the talk among the crew) and had about 2.15 lakh kilometres on the Odo. The bus was still in good shape - the suspension was in top order, and there were very little squeaks. Once past Silk Board, the bus picked up pace rapidly, and we took the Elevated highway (there was a bit of traffic at Bommanahalli, but we stuck to right lane, and could negate them quickly) to Electronic City. The driver was very sane, and made very careful overtakes. He was using the low tone horn at night, and preferred using the dipper more than the horn. 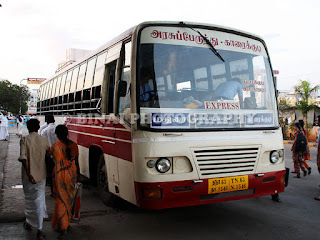 We had a pick up at Hosur – we left there at 2238. The driver and the attendant(s) [there were two of them] were chatting all the time – the Driver was an old hand at Kallada, and had been driving right from the time Volvos were introduced by Kallada. I was in love with his style of cautious driving. We did a top speed of 111kmph somewhere on the elevated highway – his top speed was in the range of 105kmph in other sections. I struggled to catch up some sleep – succeeded in it only as we were crossing Krishnagiri. I slept through – and woke up briefly as we were running past Salem. I slept again, only to wake up as the bus pulled into a fuel pump in Perundurai – at 0200. The fuel station had an array of toilets – all clean and well kept. The bus took in 222 litres of diesel. We started off at 0215. Just a while after starting off, we crossed our pairing bus – the drivers exchanged pleasantries as we moved on. The driver did not change here – and the guy was chatting all the time. The road was in horrible state after Perundurai. We did not go via Tiruppur, but stuck to the conventional route via Avinashi, Coimbatore bypass. The road was really horrible – but the body roll was minimal, unlike the Merc. I might be biased here – since I was in the second row in this bus, and on the ninth row in the Mercedes. The bad roads contributed to my misery, and was left absolutely sleepless – hardly grabbed a bit of sleep after Karumathampatty. 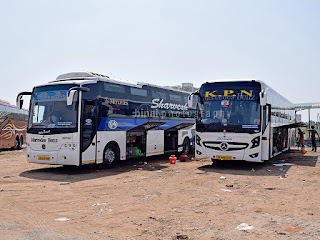 I woke up as we stopped at Neelambur toll gate – we were joined by the SRM’s Chennai-Thiruvalla Multi-Axle and the Shama’s Bangalore-Ernakulam Multi Axle (which leaves 15 minutes after us) here. Both of them overtook us on the way – I was happy that our driver did not engage in a chase, but remained composed. (We did take our revenge later). I slept lightly after the bypass ended – but was woken up by a call from dad as we neared the border. We stopped at Walayar Check post at 0404 – the assistant ran to the office, and returned very quick. We started off at 0408 – that was real quick! SRM and Shama were still waiting, while we rushed ahead. The bus stopped briefly to drop off someone at Palakkad bypass. The road worsened soon after we crossed Vadakkenchery – but the ride was much better than my outbound. We made another stop at Mannuthy – at 0547. The bus took a right, and literally rushed to Thrissur town. We surely did three digit speeds in this section. 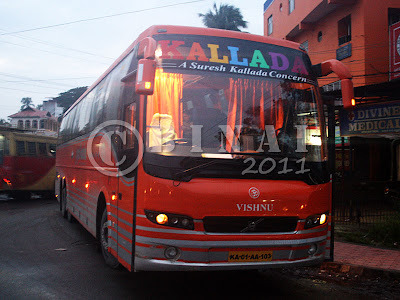 We stopped at the Kallada office at Sakthan Thampuran Nagar sharp at 0557. My dad was already there to pick me up – the luggage was retrieved from the luggage hold. The bus was still there when I got into the car and started my return. They unloaded a lot of parcels here. Concluding points.. The bus was old, but it did not show its age. It was decently kept, and most importantly, it rode really well. The NVH levels were well under control – the bus did not vibrate when idle, while the noise levels while on the run was under control. 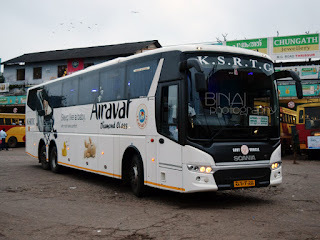 The bus took all of 8 hours, including the breaks, to reach Thrissur – that was decent, given the fact that the driver was sane!! why dont you appreciate the driver mentioning his name( if he permits) if he deserves it? Am sure, it will motivate others.